6 AM Weather fold – snowing. 8 AM Working party of 157 men detailed for work at Sawmill – hauling and unloading material etc. 10 AM Bayonet Fighting Instruction for all recent drafts. 1 PM All available men attending baths until 4.00 PM. The following are the direct hits made by the Battalion Snipers from October 25th, 1916 to January 22nd 1917. December 3, 1916 – 1 Hit. December 25, 1916 – 3 Hits. December 26, 1916 – 1 Hit. December 27, 1916 – 1 Hit. January 8, 1917 – 4 Hits. 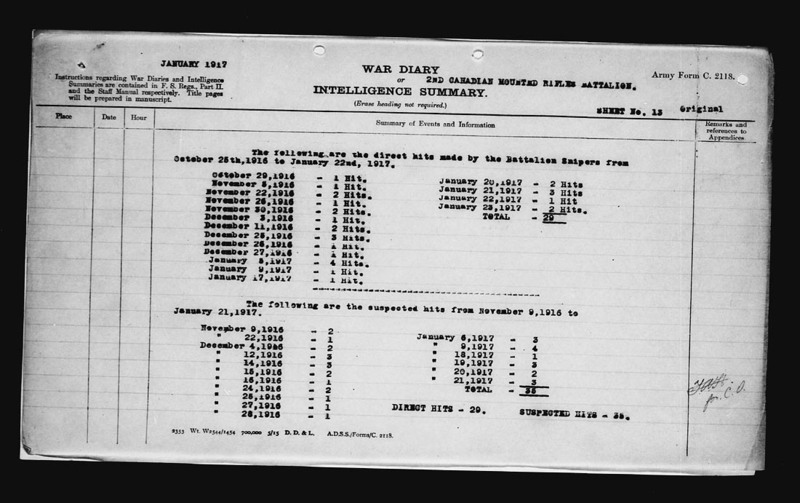 January 9, 1917 – 1 Hit. January 17, 1917 – 1 Hit. The following are the suspected hits from November 9, 1916 to January 21, 1917.